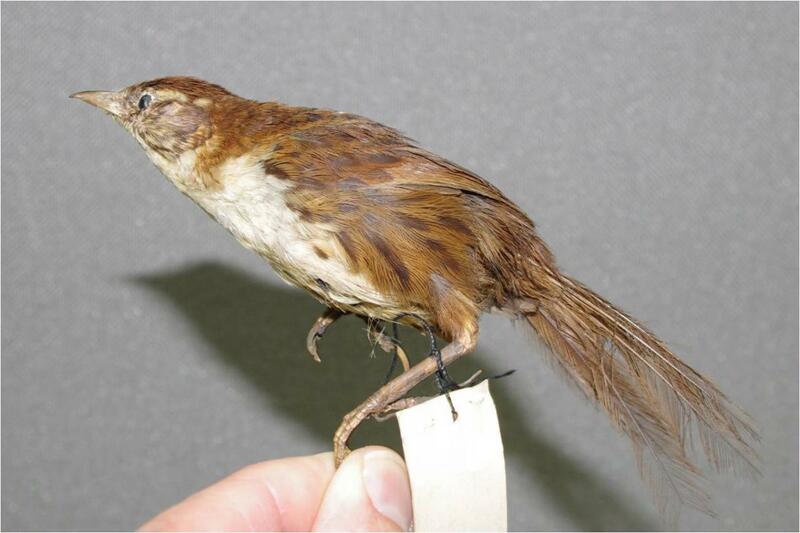 The distinctive ground-dwelling Chatham Island fernbird was only recorded alive historically from one island before its extinction late in the 19th century. 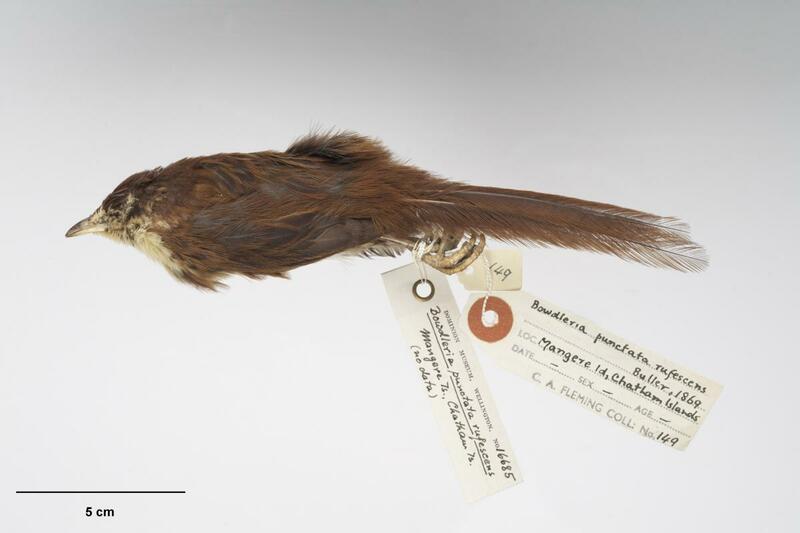 The first bird described was killed in 1868 by “knocking it over with a stone”. 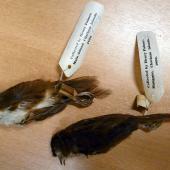 A total of only 44 skinned specimens or specimens preserved in spirits have been located in the world’s museums. However the species has been found in fossil deposits on other Chatham Islands. Only scant information was recorded about the fernbird’s behaviour. 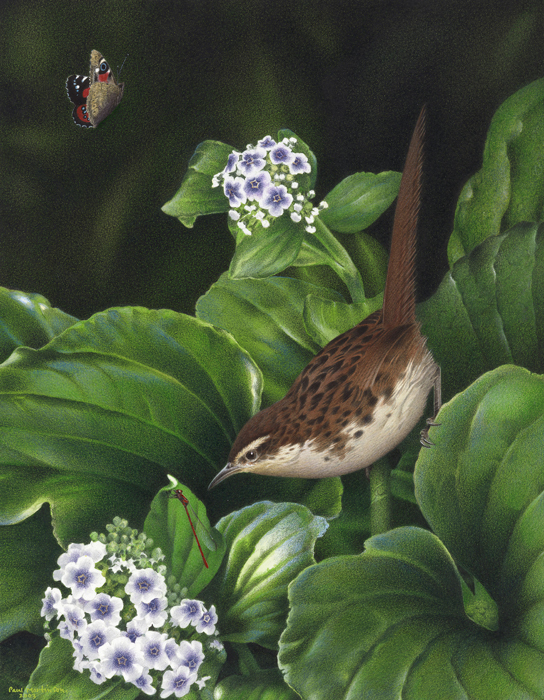 Unlike the Chatham Island species, all other forms of fernbird have survived. Chatham Island fernbirds were rufous above and white below, lacking the underside speckling found in most other fernbirds. The specific name rufescens refers to the reddish dorsal plumage. 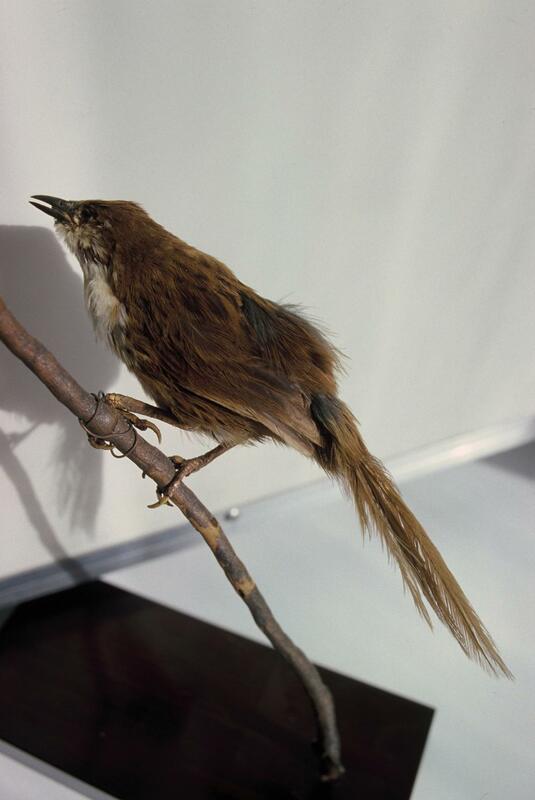 Like other fernbirds, the Chatham species had a distinctive long tail that was often frayed due to wear. 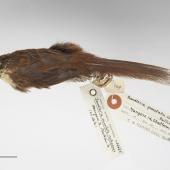 Its legs and feet were more robust than those of its mainland counterparts, yet its wings were relatively smaller, so it must have had a reduced ability to fly. Some partly white birds were reported. The species had the “typical” fernbird call but also a “peculiar whistle, very like that which a man would use in order to attract the attention of another at some distance” (Travers & Travers 1873). Historic reports record the species only from Mangere Island. However fossils tell a different story, as numerous bones have been found on both Pitt Island and on main Chatham Island, so the species was formerly widespread in the island archipelago. 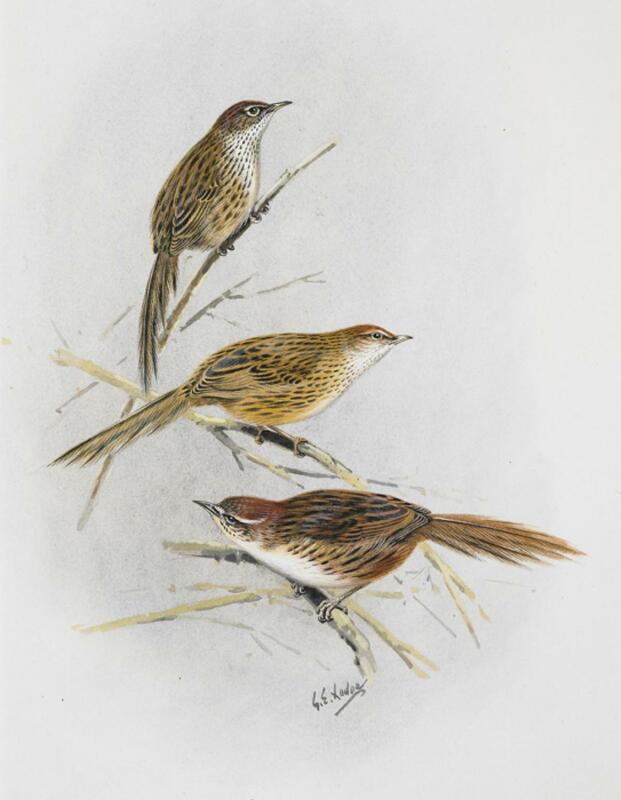 Chatham Island fernbirds were recorded as hopping rapidly from one point of concealment to another and “flitting about among the grass and stunted vegetation” (Buller 1869, Travers & Travers 1873). In 1871-72 the species was not uncommon on Mangere Island. 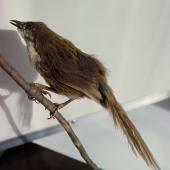 The relative abundance of fossils on Pitt and main Chatham Islands suggests that it may once have been a common bird throughout the archipelago. 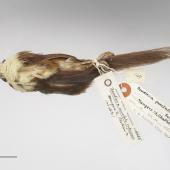 The species was probably wiped out on main Chatham Island by the Pacific rats which arrived with the first Polynesian settlers, and/or by cats. 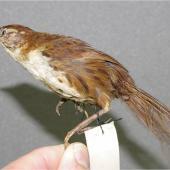 Cats are presumed to have caused the fernbird’s extinction in the 19th century on the smaller rat-free islands in the group. 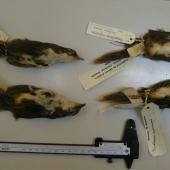 On its final stronghold of Mangere Island, the last specimens were collected in January 1895, shortly after cats were released there to control rabbits. Chatham Island fernbirds foraged for insects on the ground. The pelvis and legs were highly specialised for moving aside vegetation and litter while foraging for prey. Bartle, J.A. ; Tennyson, A.J.D. 2009. 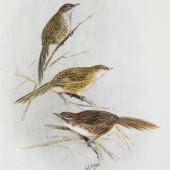 History of Walter Buller's collections of New Zealand birds. Tuhinga 20: 81-136. Buller, W. 1869. On some new species of New-Zealand birds. Ibis 5 (new series): 37-43. Buller, W.L. 1905-06. Supplement to the "Birds of New Zealand". The author, London. Hutton, F.W. 1872. 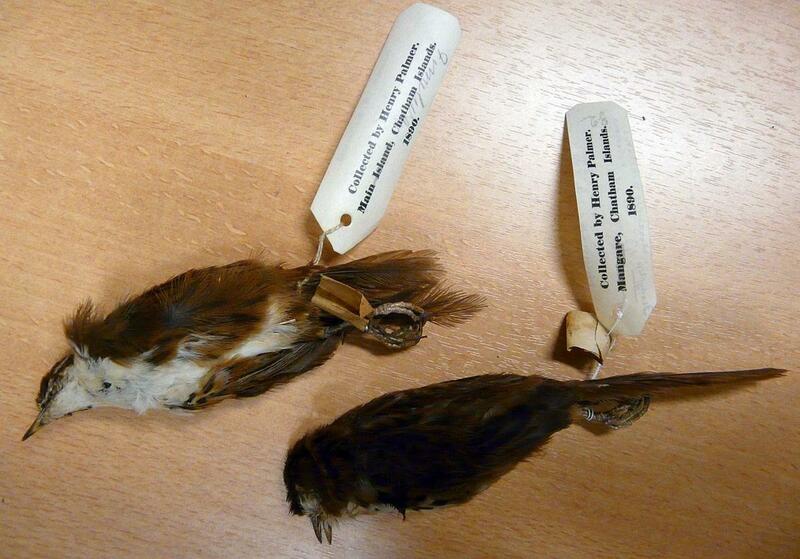 Notes on some birds from the Chatham Islands, collected by H.H. Travers, esq; with descriptions of two new species. Ibis 2 (3rd series): 243-250. Millener, P.R. 1999. The history of the Chatham Islands' bird fauna of the last 7000 years - a chronicle of change and extinction. Pp. 85-109 in Olson, S.L. (ed.) Avian paleontology at the close of the 20th century: proceedings of the 4th international meeting of the Society of Avian Paleontology and Evolution, Washington, D.C., 4-7 June 1996. Smithsonian Institution Press, Washington D.C.
Olson, S.L. 1990. 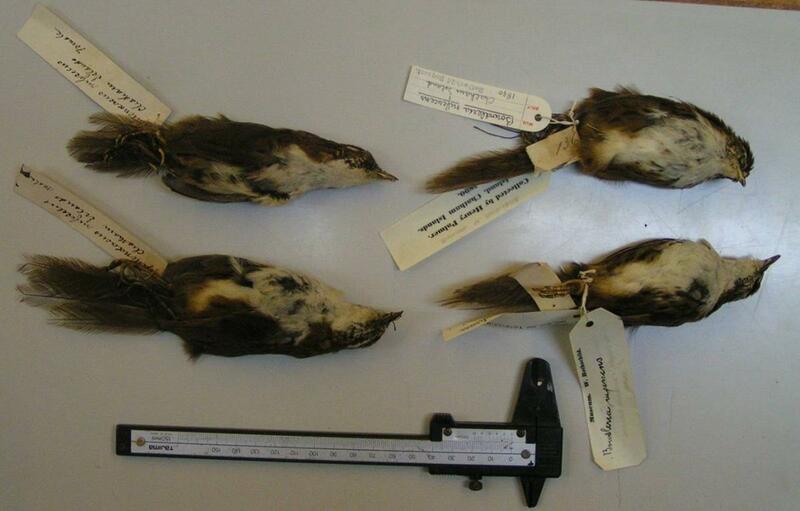 Osteology and systematics of the fernbirds (Bowdleria: Sylviidae). Notornis 37: 161-171. Tennyson, A.J.D. ; Martinson, P. 2007 (revised edition). Extinct birds of New Zealand. Te Papa Press, Wellington. Travers, H.H. ; Travers, W.T.L. 1873. On the birds of the Chatham Islands, with introductory remarks on the avi-fauna and flora of the islands in their relation to those of New Zealand. Transactions and Proceedings of the New Zealand Institute 5: 212-222. 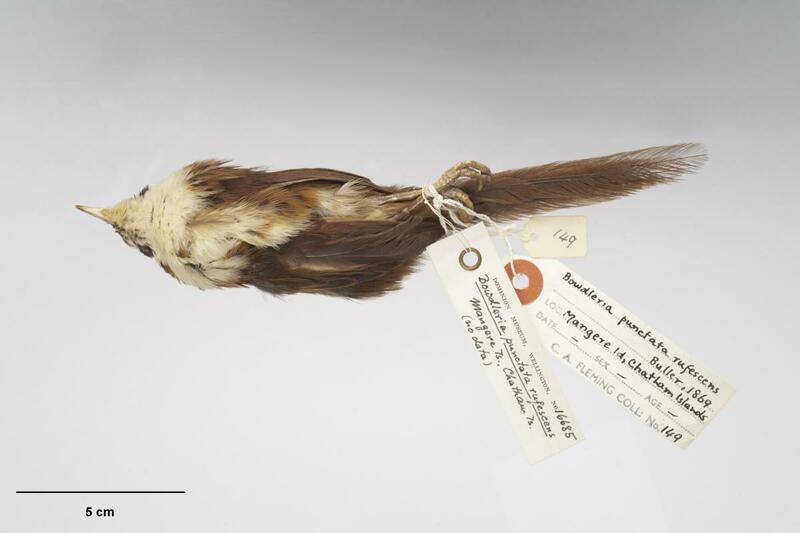 A small long-tailed extinct songbird that was reddish rufous above and white below, lacking the underside speckling found in most other fernbirds, and with tail feathers that were often frayed by wear. Its legs and feet were more robust than those of its mainland counterparts, while its wings were relatively smaller.